Shall we plant some garlic today? For the best harvest, I always plant the crop in autumn, several weeks before the first frost. The bulbs need time to make roots before the ground freezes solidly. Once rooted, garlic can survive sub-zero temperatures. What kind of garlic to grow? Well, for the longest shelf-life, choose “soft neck” varieties. These feature multiple rings of cloves that are large on the outside, and ridiculously small (and rather useless) on the inside. Soft neck garlic is standard for supermarkets. I’m a big fan of “hard neck” garlic. This kind produces just one ring of large cloves, so there’s no waste. And as an added bonus, in early summer the bulbs send up curly seed-pods, or “scapes.” Garlic scapes are screamingly-delicious. Where to obtain garlic. In my experience, locally-grown garlic from the supermarket (or farmers market) is always viable for planting. For special varieties, visit one of the many online garlic dealers. Or, just save some of your own, home-grown stock for autumn planting. Like I never do. Location and soil. Garlic doesn’t grow well in part shade, so select a planting-site that receives all-day sunshine. As for soil, it must be fertile and well-draining. A raised bed is ideal. If you don’t have a raised bed, just loosen the plot to a depth of 6 inches, and then amend it with copious quantities of compost or leaf mold. Leaf mold is wonderful stuff, my friends. I make it this way. How to Plant. First, separate the individual cloves from a head of garlic. Large cloves seem to produce the largest heads. Next, plant the cloves 3 inches deep, and with their pointed tips facing up. I space mine 6 inches apart on all sides. Cover the cloves and gently firm the soil. If your soil is dry, or if autumn rains are absent, moisten the soil thoroughly. Then mulch the bed with some shredded leaves or pine needles. Feeding and Watering.When green shoots emerge in spring, sprinkle the bed with some organic, balanced fertilizer. Give the plants 1 inch of water per week, and they will love you forever. Garlic Scapes. These curly shoots emerge in early summer from hard neck varieties. I cut them off in order to encourage further development of the bulbs below. I can assure you that garlic scapes make the best pesto on earth. Ah, Garlic Scape Pesto. You haven’t lived until you’ve tried it. Here’s the step-by-step recipe. And what about pests? Well, there won’t be any pests. Zero. Zilch. Nada. The garlicky-scent is loathed by deer, squirrels, woodchucks, chipmunks, rabbits and vampires. Insects keep their distance, too. Harvesting. Just when to dig the bulbs is largely a matter of intuition. Some gardeners harvest exactly 3 weeks after the scapes appear. Others, including me, insist on delaying harvest until one-half to two-thirds of the leaves have turned brown. Of course, I always check first, by digging up one or two bulbs. If the heads are large, lovely, and tightly-covered with papery tissue, I know that harvest-time is nigh. And by the way, never tug on stems. 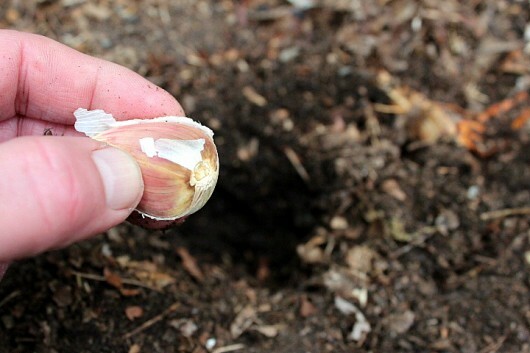 Instead, reach under the soil with your gloved hand (or, use a trowel), and lift up the bulbs. Curing. After harvest, let the bulbs dry, or “cure” for three to eight weeks in some warm, airy place which is out of the sun. Some years, I cure mine in the garden shed, setting the bulbs — their stems still intact — on an old window screen. The screen is balanced between two pots. This arrangement affords air circulation from both above and below. A wire-mesh table will work as well. When fully-cured, brush off any clinging soil, and cut stems to within an inch or so of the bulbs. You can remove the fright wig of roots now, too. Winter Storage. Garlic needs cold temperatures to store well. If you can manage it, 35°F is ideal. In my creepy Victorian cellar, hard neck garlic stays fresh and wonderful for several months in temperatures that range from 40° to 45°F. 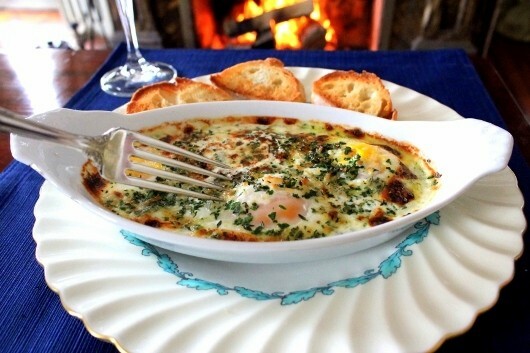 And Shirred Eggs with Herbs and Garlic. Thank you so much for sharing this. You make it sound so easy that I think I will try it again. I did once before but had a wild onion problem and couldn’t tell which was wild onion or garlic without pulling them up. Thanks for the reminder that it’s almost that time again. It’s easy to forget while in the frenzy of a zillion autumn chores. I always set aside the largest of the cured bulbs for planting, and am partial to softneck garlic for its longer storage capability. My friends with an organic market garden sell scapes at a ridiculously reasonable price, so I enjoy the best of both garlic types. Toss the smallest of the cloves in soups or on pizzas. No need to chop. I am definitely starting a leaf mold project. May I ask what else you use to amend the soil in your beds and keep it nice and fertile? I have 20 raised beds and am worried that I am not taking proper care of the soil. I usually shovel some manure in every year. But the soil doesn’t seem rich. Thanks! I am new to your blog but have quickly become a big fan. Hi Denise – Seven years ago, when my Kitchen Garden was “born,” I filled the beds with equal parts composted manure, top soil, and sand, as described in this post. Since that time, I’ve relied on shredded leaves to keep the soil fertile, friable, and moisture-retentive. Shredded leaves are nature’s compost — more details here. Not so fast with the “no pests” affirmation! The past 2 summers we have had leek moths and they can be quite a problem with garlic (especially your beloved garlic scapes). When my garlic started to come up this spring, I uncovered the sprouts from the mulch I had laid down over the winter and immediately covered the plants with a white row cover. It lets the light and water in, but keeps out the pests. It also kept the weeds down for some reason. After about a month, I uncovered the plants and they seemed to be fine – they just need to be protected during that early phase of the moth’s life. Hopefully, you won’t get them where you are, but I am not risking it again (the first year they got in my onions, chives and leeks, along with the garlic – disaster!!!). I attended our local Garlic Festival recently and purchased 12 heads of hardneck garlic for planting, cultivar = ‘Music’. I received good advice from a Master Gardener colleague to search for a cultivar GROWN AND SOLD locally to have a better chance of a good crop in my own back yard. Regional differences make some garlic cultivars behave differently – not all types are automatically happy everywhere. She was a garlic farmer a few miles down the road and she liked the reliability of ‘Music’ in our region. 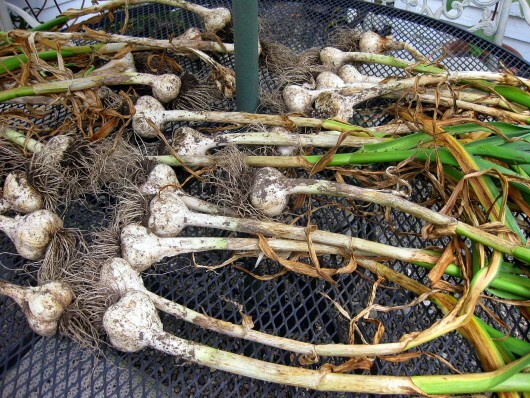 I do not yet have my garlic planting bed ready (or even emptied of vegetable plants) so I have not broken open the heads to inspect the sizes of the cloves. Heads are waiting patiently in brown paper bags in the cool dark garage. Cloves on the small side will be used for cooking and only the largest will be planted, hopefully at least 35 of them. I plant cloves 4″ on center in a grid, creating a square or rectangular patch rather than a row. When harvest time comes, I use a spading fork CAREFULLY to dig up one head at a time. It’s time consuming, but there is a rich reward for digging slowly. Past troubles in my garlic patch have included soil that held too much moisture (in combination with excess rainfall) resulting in heads that were not formed tightly, looked hideous and yellowing, and had a severely shortened shelf life. In some heads, there were one or two cloves with ensuing insect damage, having been drawn to the plant in distress. It was interesting to see how an adjacent clove was often unaffected as though the inner sheath wrappers hemmed in the insects. According to the Cooperative Extension hort agent, the insects did not cause the loose heads and yellowing. Most cloves were safe to eat, but the strong outer sheath covering had disintegrated. Stupid on my part to have chosen that wet place for a bulb. I was advised NOT to use any affected cloves for the following year’s crop. When my own stash of harvested garlic runs out in late winter and I must buy from the supermarket, invariably it’s soft neck garlic. I take the tiny center cloves which are tediously small, smash them right in their covers and deposit them in emerging crocuses or tulips to discourage chipmunks, squirrels and rabbits from descending. 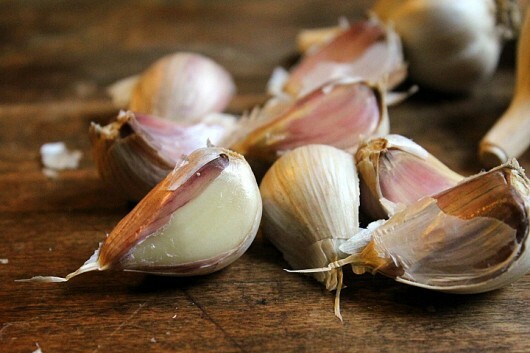 Once you’ve cooked with your own fresh garlic crop, you will be willing to plant it every fall. Thanks, Kevin, for this timely reminder. PLEASE tell us all where you are located when you comment on your growing experiences. Zone 5 supposedly, but anyone who grows here knows that we are in a microclimate of 4b. Ugh. Anyhow. OK, I’ll try garlic. Love this website and post! 2 years ago, had a great harvest. Last year, lost most of my crop because of onion maggots. No onions or leeks were planted in same bed. Planted garlic 3 days ago in a different raised bed. Will pay more attention in the spring to combat moths and flies. Purple Stripe. So, thanks to your interesting post, I might give these a try! Thanks for the timely reminder. We have first to pull out a tomato plant or two to have room. This year’s crop was disappointingly small for my first try, but I was encouraged to note that organic garlic grown locally and sold at the food co-op was also very small this year. I am planting larger cloves than I harvested so fingers crossed. I am in your zone, 5b, just north of Kansas City, and plant my garlic anywhere from October 30-November 4. I have done so for the last ten years in 4X8 raised beds. I plant them four inches deep and cover them with about 4 inches of shredded leaves. I fertilize twice during the growing saeson with 13-13-13 and water it in. I plant from my previous year’s crop and always use the largest cloves. I store them in mesh bags in a small closet in the garage that stays above freezing all winter. When I harvest the bulbs I place them on chicken wire on 3X8 frames in my pole barn on with the frames on 5 gallon buckets and let them dry naturally. I someimes put a fan on low on them for a few hours a day to speed the process. 136 bulbs this year and my best crop yet. Love your blog Kevin and for those of you who have not fixed Kevin’s Rigatoni alla Salsicca e Penne, you are missing one wonderful and easy dish. It is the best period! I love your web site! Even at my old age I have much to learn. I purchased “scapes” this summer from a local farmers market. We ate the tops in salads and were wonderful but now have the little bulbs that weren’t eaten. I’m wondering about planting these. Will they produce properly, or will I end up with very small garlic heads or nothing at all? I just put in my garlic this week. I haven’t had garlic soup since I was sick in Mexico. It is a cure all there. I took a lot of my garlic bulbs and crushed them with the side of my knife to loosen the skins then simply put the skinned cloves into the food processor and made a jar of crushed garlic to keep in the fridge for anything I make. 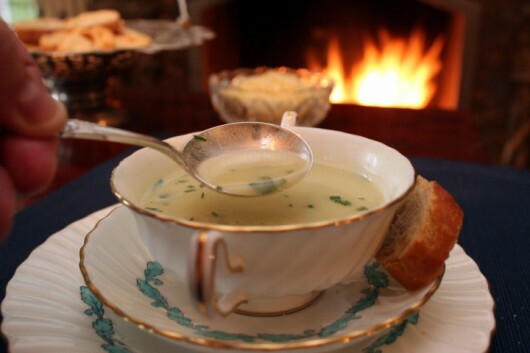 I will definitely try the garlic soup recipe. I just love the garden and all the creative things it inspires! Denise, you can plant the baby bulbs and next summer they will be a single big bulb (about the size of a clove) which you can use or plant back in the ground next Fall. 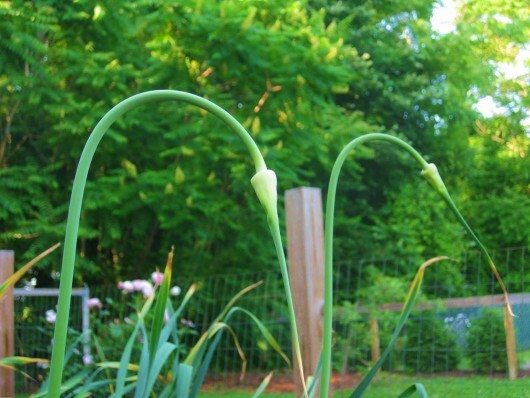 The following summer they should produce a bulb with cloves (if not, replant it one more time). I started my garlic from baby bulbs my mother gave me and now (many years later) I get a nice crop of all stages of bulbs. Every Fall I replant the new babies and most of the 2nd year bulbs along with some of the cloves to keep the crops coming. Thank you for your very wonderful article on Garlic! I will plant the cloves where I’ve harvested my last Yukon Gold and Red-Skinned Potatoes. This bed gets the most and longest sunshine in my NE Ohio garden. I think the trenching that you illustrate will go well with the trenching that was done for my taters. Will this area be ok to plant my garlic? I hope to plant another crop of tatoes next year, again. 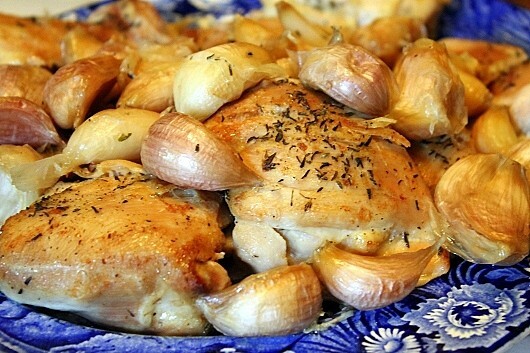 Thank you for these lovely garlic recipes. I pinned them for making on a cold winter’s day! This year I found some really big local grown heads of garlic to plant. I can’t wait to see the results next year. Thank you for the reminder on garlic, for giving the steps AGAIN so that I did not need to scroll through all the postings! I have garlic WAITING to go into the ground. No raised bed garden this year. The neighbors’s dogs are in the business of destroying gardens! Hi Kevin from Nashville TN! I have been growing garlic for years and find it the easiest of all crops ever. Here I have dilly dallied and missed my op to order from Seed Savers. I will use some of my heads from last years harvest but wondered if know of any providers that might still have some in stock. Here in the south we can plant into early November. I write this as my sprinklers are watering my greens. Purple top turnips, mustards and spinach in that good ole Tennessee dirt! Love you too! I live in SW Idaho, and grew garlic one year. I didn’t have a place to overwinter the cloves, so I placed them on a cookie sheet & froze the little buggers & popped them into a freezer ziploc. I just grab however many I want to add to dishes, pesto, etc. and voila…garlic anytime! They chop up nicely as frozen (if you go slow). We garden in coastal Maine. Harvested garlic this fall, after waiting a bit too long to store in braids…so removed the paper coverings, put the clean undamaged cloves into small jars and filled with white vinegar. These store perfectly in the back of the refrigerator and are quick when preparation time is short. Look forward to your blogs, Kevin…enjoy your sense of humor…and scrumptious recipies ! U R THE BEST! HOPEFULLY TOMORROW IS NOT TOO LATE….FEELING INSPIRED IN NO VA AND SUSAN AND PAULA’S IDEAS ARE A BOOST TO MY ERRANT PLANNING! Thanks for sharing this incredibly useful article! I like planting garlic too, because it’s one of the few vegetables in my garden that pests never touch. And some people also consider that it’s the key to eternal life 😀 But I wouldn’t count on that. I will try your storage tips, I guess they will help me keep my garlic fresh for longer, because until now I kept it in my kitchen and it became hollow after just a month or so. Hi Adriana — Sorry to hear that your garlic crop was a disappointment. 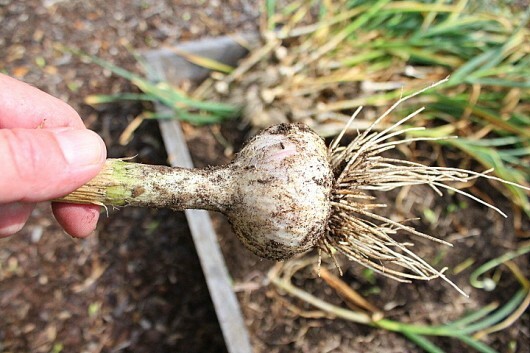 Small garlic heads with loose (not tightly-packed) cloves can be the result of many factors, including too-late planting, not enough sunlight, inadequate moisture, and/or infertile soil. Weather can affect the harvest, too. 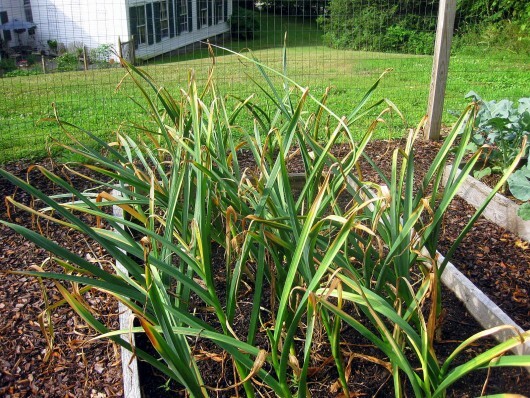 Hardy garlic (such as we plant in zone 5-b) benefits from a cold winter. Hope you’ll give the crop another try next year. Thank you, just in time, pulled my garlic on the 7/14, good advice thank you again. This year we moved into a new home in North Houston with a tiny yard (yes pitty the garden girl w not enough soil). However, I am learning to plant in pots. Do you have recommendations for planting garlic in pots? Is it even possible? Thanks for your help, I’ve been enjoying your blog for a few years now! I can’t wait to plant my garlic. I didn’t plant near enough last year. It was so much better than store bought. I’ve made many batches of pesto this summer with my globe basil and look forward to your garlic scape pesto. Thanks for all the great recipes. Beef broth today! Hi Connie – So glad you enjoy my recipes. Do make the garlic scape pesto — it’s divine! 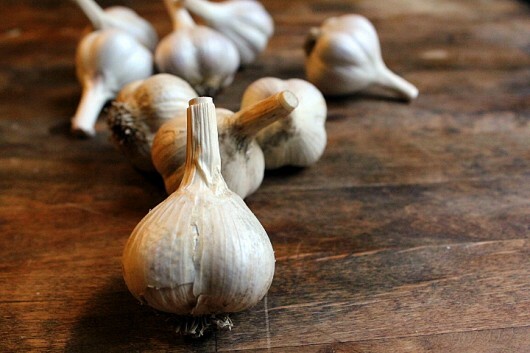 Hi Cyndi Yo – Yes, you can grow garlic in big containers. Enjoy your new home! I might try that too! Good idea. Hi Kevin, love your blog. Wondering if I can plant garlic on my South facing balcony in a planter pot. I live in Toronto Ontario. How and what should I do to get a few garlic cloves next Spring? Thank you. I had a wonderful crop of garlic this year because I followed the your steps and covered them with 4 inches of mulched leaves and planted in autumn. I think planted a little too early because half the crop started growing and they did not reappear in the spring. I live 10 miles from you so when do you think it will be safe to plant this year? Garlic is the Elixir of Life! I won’t plant mine again until after frost or colder weather arrives to ensure that they do not sprout. As long as the soil is workable keep planting. And then I sit back, think of them nestled cozily in their well mulched garden and wait to see them sprout in spring. We live in upstate NY (Schoharie County). Garlic has become my hubby’s “baby” in the last few years. We plant 80-100 in a raised bed. This year’s harvest was phenomenal. 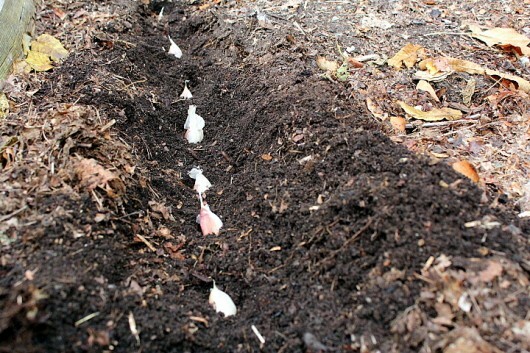 We don’t do a trench — we just poke a finger into the soil, plant the clove, and voila!!! It goes really fast, and works well. Since we have a lot of pine/evergreen trees, we mulch the beds with 3-4 inches of the needles. We grow both a white and a German red. This year, the German turned out better than ever before — some HUGE bulbs! This is a great post. I’ve been wanting to try growing garlic now that I’m in a area that actually experiences a frost. 🙂 And I have to say, “Or you can grow your own, like I never do” just cracked me up. Lol, I wasn’t expecting that. I love reading blogs by writers with a great yet subtle sense of wit. I’m trying a new variety this year, Elmer’s topset. I usually grow music but didn’t save enough to replant. I too thought that Garlic has no enemies. However, I tried a new variety last year and the slugs ate them. ALL of them. And ALL of the garlic that I gave to neighbors and Friends to plant. They were crawling up the lovely green shoots in May and were destroyed seemingly overnight. But my other standard garlic that I planted did fine. I was very sad. I’m sorry to disagree Kevin. I have found garlic doesn’t need cold temperatures to store well. I have grown garlic for years. When I pull it, I used to spread it on newspaper in front of my southern facing window for a couple of weeks. The last several years I’ve tied and hung it off the beams in my dining room which is south east facing with a lot of windows. When it’s dry, I take it down (about the time I pull my onions because I need the space to dry those) and store my garlic in an open bowl in a cabinet drawer in my kitchen. My garlic lasts until about the time garlic starts growing in the garden in the spring then it starts to sprout. This year I had the best garlic harvest ever – and yes – it takes up half that cabinet drawer. I tie my onions in the same place off my dining room beams and leave those there until I use or, sometimes put them in the veggie bin in my refrigerator about the holiday time and they last until used which is months and into spring. I purchase onions and garlic maybe once a year in the spring. I put garlic and onions into just about everything I cook so I eat them nearly every day. Kevin, I look forward to your posts. I live in zone 9b, do garlic here I come. Kevin, what are your thoughts on care of fruit trees–any information that you can share would be helpful. Please include your fabulous recipes of the fruit. Thank you in advance. I was wondering why you recommended using the garlic cloves from the grocery store. It seems that nowadays (2017), all the fresh and dry garlic powders are from China. Even the organic garlic. It makes me ill to think about it. Any thoughts? I live in AZ. Kevin, I planted garlic last fall for the first time and I was so impressed with the results! I also made scapes pesto and it was absolutely delicious! I am going to plant twice as much this fall as I did last fall. A girl has GOT to have her garlic, right? Happy planting! I’ve been lucky with my garlic. I don’t remember what variety..I’ve been growing it for 25 years saving the large cloves to replant. It stores well in my not so cold cold room for a good year and occasionally comes up where I’ve missed a head. However, my neighbour lost a big chunk of her crop to a pocket gopher before discovering the tunnel. Another comment for Adriana. If the garlic is left too late( all the leaves ripened down) the bulb will split and fall apart. The odd bulb will ripen down early for whatever reason I can’t fathom..those are the ones I tend to miss and find growing in spring. I usually transplant them individually and they will produce small heads by fall. I buy my garlic from Garener’s supply co. You get both hard and soft neck garlic. Last year I spring planted my garlic bulbs – didn’t work! So thank you for the instructions again for fall planting. Gotta get er done! Now for the important stuff. We just finished dinner. Su…perb! I made your Sweet and Sour Meatballs (rec’d 11-12-2016) served on a bed of green bean and pea vermicelli with a side of your absolutely delectable, no, delictable! Tomato Pie. This time I made it with my homemade GF biscuit recipe and used halved grape tomatoes. My, my, my! Wish you were here to share it with us. Never stop sending us stuff. So helpful. Soooo good! 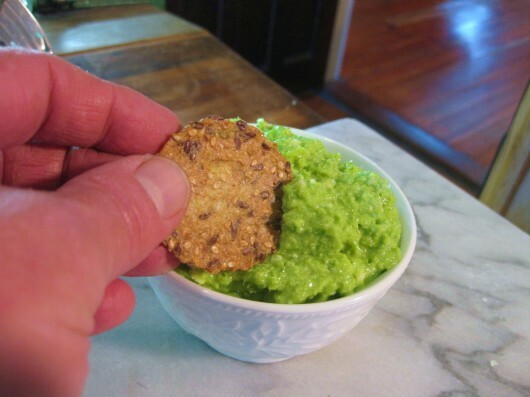 Hi Toni – So glad you liked the garlic tutorial — and the recipes. Tomato Pie with halved grape tomatoes? YUM. I’ve tugged my bulbs out of the ground for 15 years with no issues. (My soil is quite sandy.) Why do you advise never to tug them? Ahhhh! Is it too late to put some in the ground here in MD? I have a BEAUTIFUL big head of purple garlic from an Amish market that would be perfect. I’ve grown it here before but I think I’ve missed the boat this year. We just had a mild frost the other day.